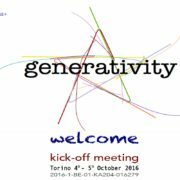 the project Generativity starts with a two days steering meeting between the partner organization in Torino. The two working days agenda is condensed, as the partners are re-designing the program of the project in order to face the impact of the cuts but still assuring a successful implementation. General agreements and distribution of tasks between partners and across the next 23 months have been on the discussion agenda as well. “Generativity: manage it!” is a project that responds to some of the questions that arise in most of the third sector organizations: the need to acquire, develop & implement skills and competences on Project Cycle Management. The term was coined in 1950 by Erik Erikson to denote a concern for establishing and guiding: in Erikson’s “Stages of Psychosocial Development”, generativity is defined as a struggle against stagnation that ascends during adulthood, when a process of guidance left the place for a process of guiding the next generations. 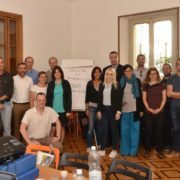 The partners of the project share their competences and skills to respond to such needs and to foster new generatively. “Generativity: manage it!” consists of an online platform (IO1); five training modules (IO2), which will be tested during a 5 days short term training staff event (LTTA); the online tutorials on PCM (IO3); a dedicated bibliography on PCM.